The red sticker program was started in 1997 by the Air Resources Board for vehicles starting in 1998 that didn’t meet the new emissions standard for green sticker vehicles. There were problems at the beginning so the vehicle date was bumped to vehicles made in 2003 and beyond. Recently, the Air Resources Board said that this program needs to be reviewed, with an eye on ending red sticker vehicles in California. They began testing red sticker bikes a year or so ago to see where they currently stand. There was a surprise, in that red sticker four strokes were not that dirty, however two strokes were very dirty. While “not that dirty” was not terrible, they still do not pass green sticker standards. The Air Resources Board is under pressure to clean up off-road vehicles and is about to come out with proposed changes. I believe they intend to do away with the red sticker program entirely and force all off-road vehicles sold after a certain date to pass green sticker or street legal standards. That poses two important questions: First, what happens to all the current red sticker vehicles already out there, and second, how will it deal with strictly racing vehicles? While we don’t know the answers yet, I can tell you what is likely to happen. We will be pushing hard for all current red sticker vehicles already out there to be grandfathered to green stickers. We will say there really aren’t that many of them and they don’t really get used that much. They may go for that or they may decide that all red sticker vehicles should only be used on closed race courses. I am pretty sure there will be some sort of exemption for selling race only vehicles (like motocross race bikes) and they will still be allowed to be sold, but only operated on closed race courses or private property. That poses a serious economic problem. What happens to older race only vehicles? Let’s say you buy a new motocross bike and race and practice only on race tracks. Sounds fine, you got the special registration for that. After a year or two you want to get a new bike to race, what do you do with your old one? Most older race bikes end up out in the desert or forest, but now these used race bikes will no longer be able to legally go there. The market will drop out for used race bikes, because no one will want to buy them. They can only be sold to people who will only take them to race tracks or take them out of state. It will be hard to justify spending a lot of money on a new bike when you can hardly sell it a year later. The part of this that doesn’t stink is that a few manufacturers (like KTM, Husqvarna and Beta) are selling street legal bikes that are clean and run very well. I am personally surprised that no Japanese manufacturers have come out with a street legal 450 dual sport bike. Yamaha is closest with its green sticker WR450f. By the way, green sticker emissions levels are not very far from the street legal level. KTM, Husqvarna and Beta have done away with their green sticker bikes altogether. They sell full-on closed course race bikes and street legal bikes only. I saw in a recent Air Resources Board report that it may well become allowed again to turn green sticker bikes street legal. We will have to see. Whatever they come up with, we will make sure that whatever science they use to support their decisions is sound science. If they reach a point where comments are being accepted, we will let you know here, on our Facebook page and in a mass email. Reauthorization has been a bumpy road. The reauthorization bill just went through the Assembly Water Parks and Wildlife committee. Unfortunately, the concerns we have in the bill have not been amended to our satisfaction. We still have a couple stops where we can try to have our needs met. Here are a few of our current objections: The bill will send money for our program to State Parks instead of the OHV Trust Fund. It requires annual reporting on the number and types of injuries and accidents and the number and types of citations and other enforcement actions at State Vehicular Recreation Areas. It adds the U.S. Fish and Wildlife Service and the California Department of Fish and Wildlife to the entities to develop soil conservation guidelines, and requires those standards to be updated every five years. It amends the division’s authority by prioritizing natural and cultural resources among the primary purposes of the division. It adds to the wildlife inventory an inventory of native plants, both of which shall be updated every five years. It expands the monitoring programs to focus on soil erosion, wildlife, and natural and cultural resources. They removed the word “unnatural” next to errosion, making the OHV division responsible for fixing acts of nature in SVRA’s. There is still a five year sunset until we have to go through all this again. It is obvious they don’t like us and want to change the focus of our program from recreation to conservation. It is not just us and our lobbyist Kathy Lynch (thanks again Polairis for the grant!) working on this. 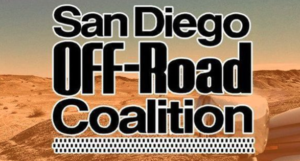 We are part of a larger coalition working with the American Sand Association, California Association of Four Wheel Drive Clubs, AMA D36, D37 and National, Blue Ribbon Coalition, Off-Road Business Association and the California Off-Road Vehicle Association. Remember, SDORC is a membership organization. You can not only join us through our website, but you can also get an early entry discount for our Lost Lizard Fun Run this coming November 4. We’d love to meet you at our regular monthly meetings the first Tuesday of the month. We will also be at Off-Road Nights, Sand Sport Super Show and other coming events.